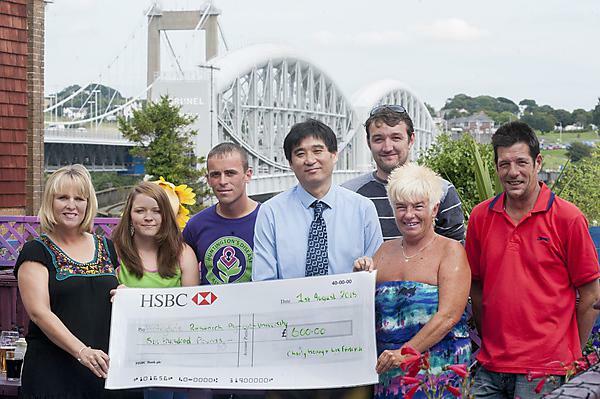 A group of local people affected by Huntington’s disease are to hold a family fun day at The Two Bridges pub in Saltash this Saturday, 20 August to raise money for research into the disease at Plymouth University. There will be face painting, a barbecue and live music from 2pm until the pub shuts. There will also be a raffle and auction. The group ran a similar event at the pub last year and raised £600 – they hope to beat that figure this year. The event is part of a wider range of activities run by local people affected by Huntington’s disease to raise money to support research into the disease at Plymouth University Peninsula Schools of Medicine and Dentistry (PUPSMD). The group has set itself a target of £20,000 and has already raised the impressive sum of £8,000. Planned events for later this year include an ‘aerobathon’ (a sponsored keep fit class) and a golf day. Researchers from PUPSMD are investigating the potential of manipulating activity at a cellular level in order to develop an effective therapy for Huntington’s disease. The team are analysing a protein called Bim, which causes cell death in various tissues including those of the brain. At present it is unclear how Bim levels and activity increase in Huntington’s disease, and the study will aim to identify the mechanism which allows this increase. By understanding the mechanism and how it works, the way could be open for manipulating it to create an effective therapy for the disease. Anyone wanting more information about the family fun day, or who would like to make a donation or provide prizes and action lots, should email Liz Fedrick at lizfedrick33@gmail.com.